Paru, The Famous Amboseli National Park Resident delivers twins. A boy and a girl, the calves were born at the end of May to a 38-year-old female named Paru. She’s part of a 40-member family — and everyone, including the new babies’ big sister, has been pitching in to help look after them. Now 2 months old, the calves are continuing to defy the odds. Research suggests there is a less than 1 percent chance that mother elephants will give birth to twins. If they are born, it’s very likely one will die shortly after birth. So far, the calves are doing very well, never straying too far from Mom or the rest of the family. They’re in the best place for staying safe, too; in the national park, local community members and rangers unite to protect the animals from the all-too-common risk of poaching. Thankfully, these babies get to live in the wild where they belong — but they are never too far away from rangers in case they need help. 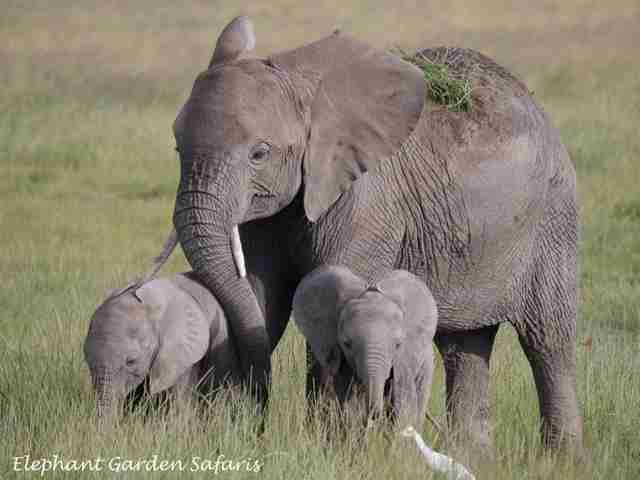 And the rangers, who often feel like the elephants are family, couldn’t be more excited to watch the twins grow up. To help more elephant calves in the wild, you can make a donation to the David Sheldrick Wildlife Trust. Previous PostHow Did Africa Get its Name?